Thank you for sharing that Art. Never mind then. It was just Gamow gamesmanship. Proves you just can't trust them dang scientists! The boundaries of a Kerr (rotating) black hole. <<A rotating black hole is a black hole that possesses angular momentum. In particular, it rotates about one of its axes of symmetry. Rotating black holes are formed in the gravitational collapse of a massive spinning star or from the collapse of a collection of stars or gas with a total non-zero angular momentum. As most stars rotate it is expected that most black holes in nature are rotating black holes. In late 2006, astronomers reported estimates of the spin rates of black holes in The Astrophysical Journal. A black hole in the Milky Way, GRS 1915+105, may rotate 1,150 times per second (i.e., C# : two octives above middle C), approaching the theoretical upper limit. 1E+570Z . . . to . . . 4E+570Z . . .
Neutronium, of course. But only stable under the extreme conditions inside neutron stars. If the entire star was nothing but neutrons they couldn't be so magnetic. 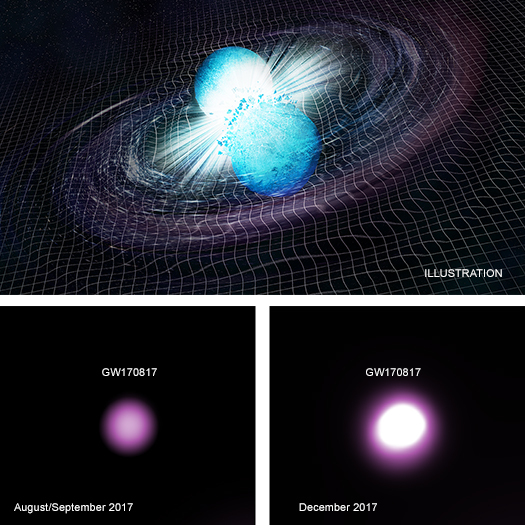 Last year, the first detection of gravitational waves linked to a gamma-ray burst triggered a vast follow-up campaign with ground and space telescopes to study the aftermath of the neutron star merger that gave rise to the explosion. ESA's XMM-Newton observations, obtained a few months after the discovery, caught the moment when its X-ray emission stopped increasing, opening new questions about the nature of this peculiar source. What are the odds that a neutron star collision produces a neutron star, as opposed to a black hole? Is it close to 50% ? Is there a known/expected distribution of sizes for neutron stars? And perhaps they don't get much chance to interact beyond a single pair that may have formed as a binary ... still, in a globular cluster or a galactic center, perhaps there are lots of them in proximity. Presumably if they have a combined mass of about 4 Sols, they will have enough mass that their product will form a black hole, rather than a larger neutron star. How different would that event appear to LIGO ? <<Neutronium [Nu] is a hypothetical substance composed purely of neutrons. The word was coined by scientist Andreas von Antropoff in 1926 (before the discovery of the neutron) for the conjectured "element of atomic number zero" that he placed at the head of the periodic table. 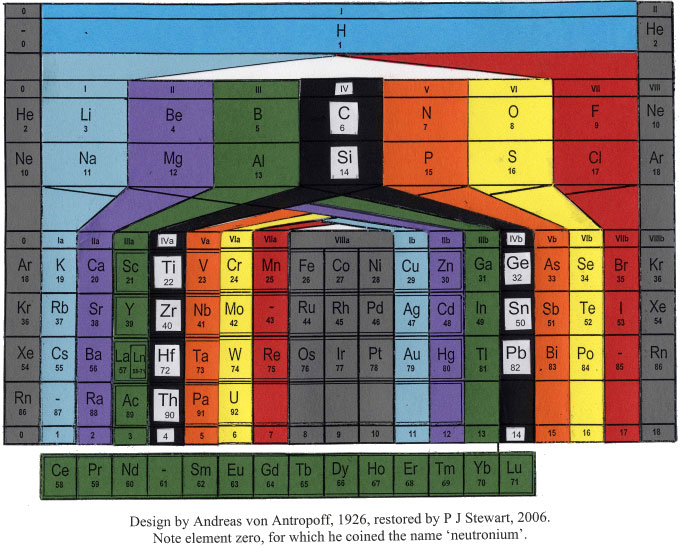 It was subsequently placed in the middle of several spiral representations of the periodic system for classifying the chemical elements, such as those of Charles Janet (1928), E. I. Emerson (1944), John D. Clark (1950) and in Philip Stewart's Chemical Galaxy (2005). However, the meaning of the term has changed over time, and from the last half of the 20th century onward it has been also used to refer to extremely dense substances resembling the neutron-degenerate matter theorized to exist in the cores of neutron stars; hereinafter "degenerate neutronium" will refer to this. The term "neutronium" has been popular in science fiction since at least the middle of the 20th century. It typically refers to an extremely dense, incredibly strong form of matter. While presumably inspired by the concept of neutron-degenerate matter in the cores of neutron stars, the material used in fiction bears at most only a superficial resemblance, usually depicted as an extremely strong solid under Earth-like conditions, or possessing exotic properties such as the ability to manipulate time and space. In contrast, all proposed forms of neutron star core material are fluids and are extremely unstable at pressures lower than that found in stellar cores. According to one analysis, a neutron star with a mass below about 0.2 solar masses would explode. Dineutron: The dineutron, containing two neutrons was unambiguously observed in the decay of beryllium-16, in 2012 by researchers at Michigan State University. It is not a bound particle, but had been proposed as an extremely short-lived state produced by nuclear reactions involving tritium. It has been suggested to have a transitory existence in nuclear reactions produced by helions (helium 3 nuclei, completely ionised)that result in the formation of a proton and a nucleus having the same atomic number as the target nucleus but a mass number two units greater. The dineutron hypothesis had been used in nuclear reactions with exotic nuclei for a long time. Several applications of the dineutron in nuclear reactions can be found in review papers. Its existence has been proven to be relevant for nuclear structure of exotic nuclei. A system made up of only two neutrons is not bound, though the attraction between them is very nearly enough to make them so. This has some consequences on nucleosynthesis and the abundance of the chemical elements. 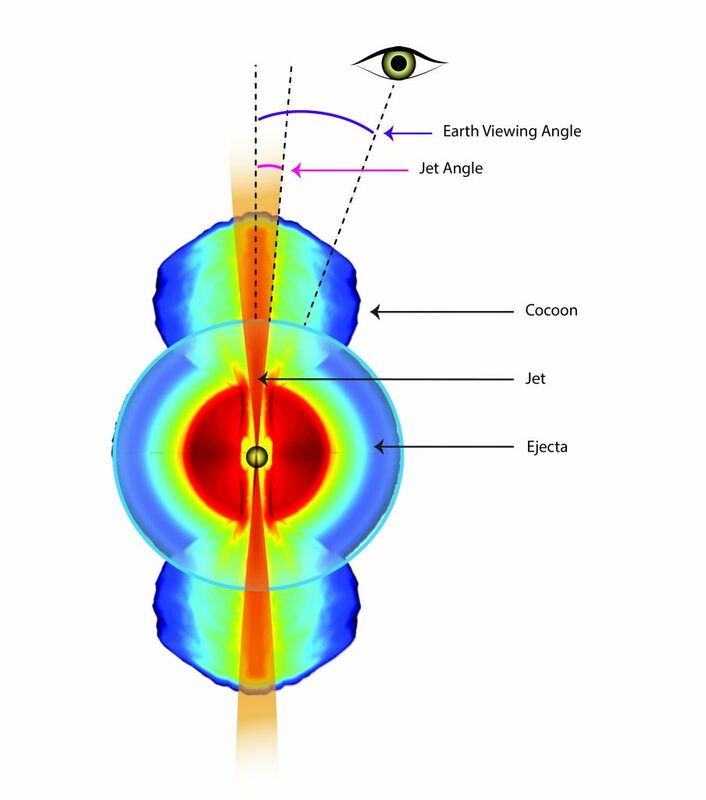 <<A neutron star has a mass of at least 1.1 and perhaps up to 3 solar masses (M☉). The maximum observed mass of neutron stars is about 2.01 M☉. But in general, compact stars of less than 1.39 M☉ (the Chandrasekhar limit) are white dwarfs, whereas compact stars with a mass between 1.4 M☉ and 3 M☉ (the Tolman–Oppenheimer–Volkoff limit) should be neutron stars (though there is an interval of a few tenths of a solar mass where the masses of low-mass neutron stars and high-mass white dwarfs can overlap). Between 3 M☉ and 5 M☉, hypothetical intermediate-mass stars such as quark stars and electroweak stars have been proposed, but none have been shown to exist. Beyond 10 M☉ the stellar remnant will overcome the neutron degeneracy pressure and gravitational collapse will usually occur to produce a black hole, though the smallest observed mass of a stellar black hole is about 5 M☉. Low mass double neutron star mergers (over billions of years) in which the end product isn't a black hole must be relatively common. Otherwise, the heavy elements only produced by them wouldn't be nearly as widespread as they apparently are. Precise measurement using a continent-wide collection of National Science Foundation (NSF) radio telescopes has revealed that a narrow jet of particles moving at nearly the speed of light broke out into interstellar space after a pair of neutron stars merged in a galaxy 130 million light-years from Earth. The merger, which occurred in August of 2017, sent gravitational waves rippling through space. It was the first event ever to be detected both by gravitational waves and electromagnetic waves, including gamma rays, X-rays, visible light, and radio waves. The aftermath of the merger, called GW170817, was observed by orbiting and ground-based telescopes around the world. Scientists watched as the characteristics of the received waves changed with time, and used the changes as clues to reveal the nature of the phenomena that followed the merger. One question that stood out, even months after the merger, was whether or not the event had produced a narrow, fast-moving jet of material that made its way into interstellar space. 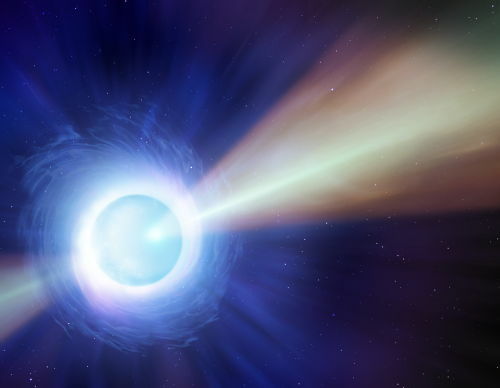 That was important, because such jets are required to produce the type of gamma ray bursts that theorists had said should be caused by the merger of neutron-star pairs. The answer came when astronomers used a combination of the NSF’s Very Long Baseline Array (VLBA), the Karl G. Jansky Very Large Array (VLA), and the Robert C. Byrd Green Bank Telescope (GBT) and discovered that a region of radio emission from the merger had moved, and the motion was so fast that only a jet could explain its speed.